The world, not just the UN, is waking up to the power of faith-based organizations (FBOs). How can Islam, and other faiths, contribute to solutions to sustainability and mitigate climate change risks? Odeh Al-Jayyousi, Professor and head of innovation at Arabian Gulf University in Bahrain, scholar in sustainable innovation and a member of UN Global Scientific Advisory Panel, for UN Environment’s Global Environment Outlook 6 (GEO6), argues that Islamic worldview represents a unique model for a transition to sustainable development by focusing on justice, degrowth and harmony between human and nature. He commented that Islam views the environmental challenges as an indicator for a moral and ethical crisis. Looking at the creation of human, Earth, and cosmos as signs of the Creator (Kitab Manthoor) is a key in Islamic values. Professor Al-Jayyousi calls to revive the holistic view of Islam which is founded on the notion of harmony and “natural state” (fitra) and in respecting balance (mizan) and proportion (mikdar) in the systems of the universe. These notions provide an ethical dimension and a mandate for all humans to respect nature and all forms of life. Hence, the overcoming environmental crisis and mitigating the impact of climate change, from an Islamic perspective is underpinned by defining the role of humans as trustees and stewards (khalifah). This balance has been disturbed because to human choices which result in overconsumption, overexploitation and overuse of resources. Islamic values call to save integrity and to protect the diversity of all forms of life. Professor Al-Jayyousi commented that the ecological crisis is linked to human ethics and values. Human actions are responsible for the global ecological crisis. “Reflecting on the main environmental problems, such as the destruction of natural habitats, loss of biodiversity, climate change, and erosion of soil, we see that all are triggered by human greed and ignorance. Human responsibility is to save and protect livelihood and ecosystem services to ensure a sustainable civilization learning from and reflecting on the fate of past civilizations”, said Professor Al-Jayyousi. He cited a verse from the Holy Book, Quran, “Every living thing is in a state of worship”. He commented that when one hurts a bird or a plant, he/she is silencing a community of worshippers. To celebrate the symphony of life, all humans need to celebrate and protect biological and cultural diversity. Islamic worldview calls to make a transition to a sustainable society and economy by adopting responsible development and respecting sustainability principles. This change requires a shift in norms and practices. Religion can become a powerful part of the solution if humans embody a holistic spiritual view towards mankind, earth and cosmos. In 2015 in Istanbul, the Muslim world in its Islamic declaration for climate change set the framework for an ethical code of conduct to build a low-emission climate resilient future. Al-Jayyousi aspires to see a new Islamic discourse that emphasizes and links faith, reason and empathy to ensure an ecological insight (Baseera). He calls to rethink educational systems that neglected the beauty and majesty of nature and the cosmos. “The extinction of species around us which are simply communities like us (Ummam Amthalokom) may extend to humankind unless we change our worldviews and development models”, warns Prof. Al-Jayyousi. He calls to revive the concept of Green Endowment Fund (Waqf) to support a transition to sustainable economy by promoting innovation (ijtihad) inspired by nature and culture. He refers to this as a Green JIZ model, which represents an Islamic response to climate change embodying the concept of de-growth. “Conflict and poor governance are putting the Middle East and North Africa at jeopardy” points out Prof. Al-Jayyousi. He calls for a sustainable region that is founded on human and environmental justice. An optimist, Prof. Al-Jayyousi is inspired by prophet Mohammed saying “If it is the Last day of life and you have a small plant, make sure you plant it”. By Odeh Al-Jayyousi, published in UN Environment. Professor Odeh Al-Jayyousi is the head of Innovation and Technology Management at Arabian Gulf University, Bahrain. He published a book on “Islam and sustainable development”, UK, (2012) and a book on Integral Innovation, 2017, UK. He is a member of UN GEO6- Scientific Advisory Panel. 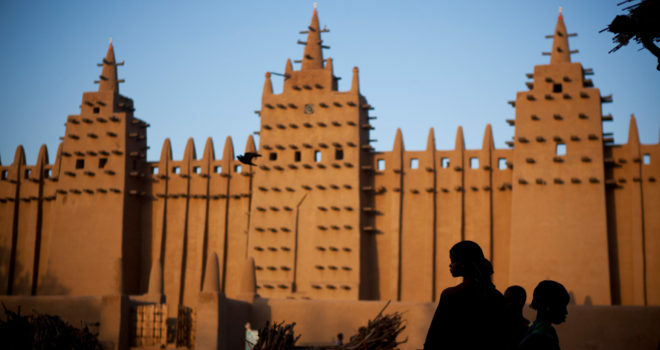 The Great Mosque at Djenné in Mali at sunrise, Credit Damon Winter The NYT.